There are many students in search of a strategy that will help them escape their debts. However, not all of them know that federal loans can be forgiven for the reason that schools use illegal recruiting tactics like promising students well-paid careers. For many students, the public service forgiveness seems like a good dream. Actually, not every borrower may be eligible for forgiveness. There are particular rules which specify what exactly can be forgiven. Most public debt-forgiveness programs require a person to make 120 qualifying timely payments. All of them have to be made during the time a person is working for a qualified employer. In addition, it should be noted that only payments that were made after October 1, 2007 qualify for earning eligibility. If a person does not hold a position in a public service, he or she still has a chance to get the student debts forgiven, it just requires more time. According to income-based repayment plans, you have an opportunity to get debt forgiveness only after you reach 20 years. Which Loans Can Be Forgiven? Only direct loans that are made by federal government are eligible for forgiveness. It should be noted that federal student debt forgiveness program does not include non-federal loans, which are handled by loan companies or private lenders. Some lawmakers have an opinion that there is a risk that this would have an unintended consequence: borrowers will get forgiveness for their loans and incur more debt than they are able to repay. In addition, some experts fear that universities will take advantage of this mindset and force students to take on a debt by promoting such forgiveness programs. The debt forgiveness programs will have some changes in future. It has been already suggested to limit the amount that can be forgiven for every particular person. However, the senior vice president does not believe that this offering will pass. At the same time, he admits that some changes are going to be made in the programs, and there is no exact answer to how they will influence borrowers’ ability to pay out their debts. The borrowers are warned against risking their future. This is particularly important for those who are tied to public service. Such kind of loan forgiveness becomes possible for a person only after 10 years of full-time service, and borrowers who stop their work earlier will not get the forgiveness, so they risk a lot when they rely only on such programs. 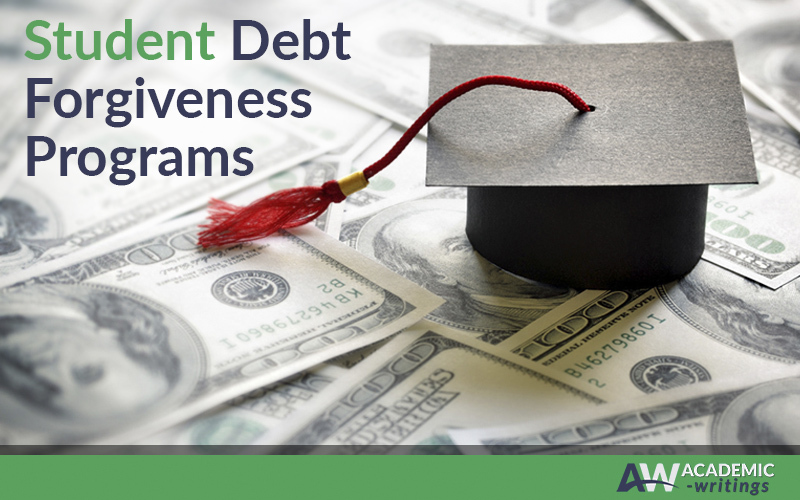 Student debt forgiveness programs have many advantages. However, their future is unclear. For this reason, students have to be careful with debts.